Caribbean Reggae Artist Daddy Roots hails from the tiny and gorgeous island of Anguilla in the British West Indies. 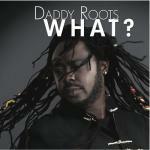 Having developed a first-rate reputation for his live performances, Daddy Roots has entertained audiences internationally in the Caribbean, U.S.A., Canada, Africa, Asia and Europe. In Daddy Roots you will hear both the spirits of Bob Marley and Peter Tosh embodied into his style of singing and with his own personality prominently in the forefront in his live performances. He has recent music placement in Adam Sandler's 2011 movie with Jennifer Aniston "Just Go With It", song title "Duppy Can't frighten Me". Daddy Roots vocals are used by Magic Soul Orchestra for their song "Compressor" which is in one of the hottest iphone games "Tap, Tap, Dance" purchased and downloaded over 3,000,000 times world-wide. He also has previous music placements in Bill Murray's movie "Broken Flowers" and BBC Lifetime movie "The Fugitive" with song title "Magar Goat" from his debut album "Love and Honor. In 2006, he won "Best Reggae Male Vocalist" in the L.A. Music Awards.